"Everyone must leave something behind when he dies. A child or a book or a painting or a house or a wall built or a pair of shoes made. Or a garden planted. Something your hand touched in some way so your soul has somewhere to go when you die, and when people look at that tree or that flower you planted, you're there." is about this exact kind of soft immortality, poring over the fingerprints left by a person after their death. In 2002 Booth founded a squat in Brighton and upon cracking it open she discovered the dusty artefacts of a dead woman, Anne Clarke. Scattered about the place were her books, diaries, art, correspondence, photographs, records - even a hip bone (maybe Ann's own after her hip replacement in later life). Booth, feeling the instinct to honour the woman whose house she now occupied, began assembling this papery puzzle. Prime among them is a cool sense of your own mortality - it's impossible not to look at this yellowing pile of paper and objects and wonder what you'll leave behind after you've kicked the bucket. Everyone likes to think they'll leave some grand mark of the world and, at first glance, Clarke didn't. In the grand scale of things, the life of a former 60s radical turned alcoholic, largely ignored by her children as her (and her generation's) hopes were gradually leached away by disappointment and booze, doesn't add up to much. 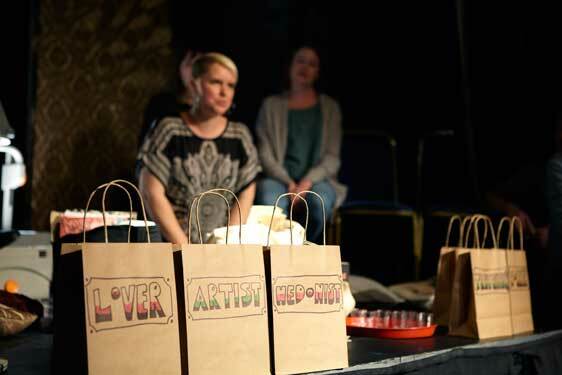 Hip is at Vaults Festival until 5 February, then on tour.